In corporate security today, while the topic of information technology (IT) security metrics has been extensively covered, there are too few knowledgeable contributions to the significantly larger field of global enterprise protection. 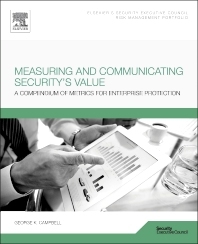 Measuring and Communicating Security’s Value addresses this dearth of information by offering a collection of lessons learned and proven approaches to enterprise security management. Authored by George Campbell, emeritus faculty of the Security Executive Council and former chief security officer of Fidelity Investments, this book can be used in conjunction with Measures and Metrics in Corporate Security, the foundational text for security metrics. This book builds on that foundation and covers the why, what, and how of a security metrics program, risk reporting, insider risk, building influence, business alignment, and much more. Great Data, Great Opportunity but Bad Presentation! What is the State of the Art in Corporate Security Metrics? When Does an Avoidable Risk Become Inevitable? Is Compliance a Key Risk Indicator or a Key Performance Indicator? George Campbell served until 2002 as the chief security officer (CSO) at Fidelity Investments, the largest mutual fund company in the United States, with more than $2 trillion in customer assets and 32,500 employees. Under Campbell’s leadership, the global corporate security organization delivered a wide range of proprietary services including information security, disaster recovery planning and crisis management, criminal investigations, fraud prevention, property and executive protection, and proprietary security system design, engineering, and installation. Since leaving Fidelity, Campbell has served as a content expert for the Security Executive Council, of which he is a founding Emeritus Faculty member. Prior to working at Fidelity Investments, Campbell owned a security and consulting firm, which specialized in risk assessment and security program management. He has also been group vice president at a system engineering firm that supported government security programs at high-threat sites around the world. Early on in his career, Campbell worked in the criminal justice system, and served in various line and senior management positions within federal, state, and local government agencies. Campbell received his bachelor’s degree in police administration from American University in Washington, D.C. He served on the board of directors of the International Security Management Association (ISMA), and as ISMA’s president in 2003. Campbell is also a long-time member of ASIS International. He is a former member of the National Council on Crime Prevention, the High Technology Crime Investigation Association, and the Association of Certified Fraud Examiners, and is an alumnus of the U.S. State Department’s Overseas Security Advisory Council.